December is a month that is stressful, but not because we're still going all out on building a better tomorrow for ourselves. Rather, December becomes almost a lost month because we have to (if we celebrate Christmas) go shopping for gifts, get online and comparison shop for bargains, book trips and travel, host relatives, and prepare fancy meals. All of this is daunting. Watching television is all people can think about doing with the little energy they have left. I don't blame them. Heck, I had to give in the other day to my wife's request to take a break and watch the movie, Pitch Perfect, in its entirety. Confession: I loved Pitch Perfect! I'll give you a right hook in the mouth if you make fun of me. 1. Declutter and donate. Imagine you have to set up for a yard sale happening tomorrow. Now go through all of the closets in the house and find clothes that no longer fit, ties that are out of style, and clothes you don't ever want to see on your child/husband again. Stuff these in a plastic bag and donate them to the Salvation Army. Get a receipt. Now you have another deductible item for your 2016 taxes. Hint: You can also donate toys and knickknacks. 2. Update Your Beneficiaries. 2017 may be the year you die. As a cyclist, I'm always only a few feet from getting walloped by a car. This is why I make sure I check who's getting my retirement, bank account, and annuity money, life insurance payoff, and investment homes. I had a divorce in 2007 and I needed to get my ex-wife off my assets like pronto, yo! Did you get a divorce? Did you have kids in 2016? Better check who's gettin' your money! 3. Create a budget for January. Why should your budget, if you have one, be any different in January? 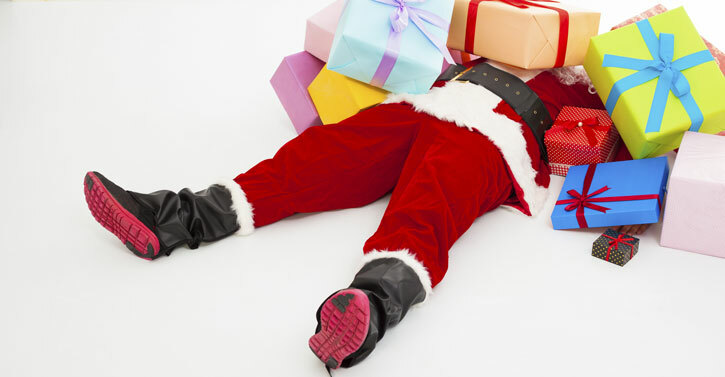 Well, did you overspend on your gifts this year? Chances are you did. In fact, most people go over their Christmas gift budget by 20%. You have to make up this shortfall. You can do it all in January or you can adjust February's budget as well so you make it easier on yourself to tighten the belt. 4. Make a quick will. Google: "will template, (insert your state)." You'll get a template that you can download, and fill-in blanks within a short amount of time for free. It's not a long-term solution until you can have it reviewed by an estate attorney, but it will do for now. It's better than nothing. 5. Shred files with your social, credit card info, etc. If you're like me, you probably have a shoe box full of envelopes with letters from your bank, investment houses, credit card companies, and so on. What if someone were to break into your home? Is this info you want accessible to an intruder, or even someone you think is trustworthy that happens to be staying in your home? Shred those documents. Keep only electronic versions of your tax returns, password protected. If you have hard copies, shred them if they're more than 3 years old and go electronic from now on. 6. Change your passwords. I know this sounds like a lot of work, but you have to do it. Yahoo had a breach and didn't even know it for years. Don't go more than 3 months without changing your passwords. Use a password manager like, LastPass. It's free for your desktop/laptop. If one of your passwords is, 123456 or 1234567 or 12345678...you're a moron! Change it now. 7. Check your credit report. Request a free credit report from AnnualCreditReport.com. There's no catch if you use their site. You'll want to make sure there are no mistakes or suspicious activity. 8. Eat up that FSA balance. Do you have a Flexible Spending Account? I hate forgetting to use the dollars I've put into mine. Some employers allow a $500 roll-over. Some don't. So check with your employer and if they don't...refill all your anxiety and depression meds, get new glasses, or go to the dentist. That reminds me, I have to fill up my Citalopram bottle. Gotta love drugs in the USA! 9. Check your investment fees. You may have bought into an investment like a mutual fund or an annuity without much thought to fees, especially if you had the power to do this within your 401k. Now's the time to review any pertinent paperwork and check what you're being charged. Fees will kill your returns over time. 10. Sell your losers. If you're in the green so far this year within your stock portfolio and have done some short-term selling, you'll need to offset those gains with some losses to lower your tax bill. If you sucked and didn't have any gains, you can offset up to $3,000 of your regular income. Any losses beyond $3K can be deducted from your future regular taxable income. Sorry to disappoint but these investment losses deductions can only be taken from taxable accounts so forget about claiming them if they occurred in your IRAs or 401k. There are still a few days before the year ends. You can sit around waiting for January 1st to get going again (if you're not hung over), or you can make some easy financial moves right now. What's it gonna be? Thanks for reading. If this has been of any value to you, I'd really appreciate any sort of love. You can Google Plus or add me to your circles, add me on Twitter, or even subscribe to this blog for automated delivery of these articles. No spam. Until next time.